Our last writer spotlight with Colleen AF Venable is a hard act to follow. 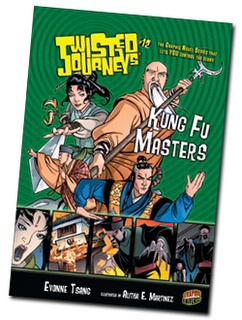 This week, I interrogated Evonne Tsang, author of Twisted Journeys #12 Kung Fu Masters and some of our upcoming books. $50 to write someone’s paper. Ha ha, just kidding. Helping someone cheat in school would be wrong. You know they say cheaters never prosper. Neither do English majors. I started off writing prose, so writing a Twisted Journeys book was really great since it let me figure out how to write comics in baby steps while still writing prose. I was incredibly lucky to have Alitha Martinez draw Kung Fu Masters. Her art is just spectacular and she often improved the story effect I was trying to create on the page. We actually didn’t communicate during book production, although we got to be good friends about a year later and hope to work together again later this year. Kung Fu Masters was my first book, so I found that the structure made it easier to write. Sometimes it’s hard to figure out what happens next when everything is completely open ended. A completely blank page can be intimidating! Having some restrictions opened it up for me to get creative within the Twisted Journeys structure. I’m currently working on a horror graphic novel for Graphic Universe and I’ve been threatening to turn my friends into victims. And they can’t do anything to stop me! Bwah ha ha! Nah, I’m kidding. I like my friends. Obviously, this is the time to take revenge on the lying jerk in third grade who told the teachers I was trying to set the cafeteria on fire. Nurture your grudges—you never know when the opportunity for revenge may arise! I like movie scores or quiet. Since movie scores are created to support a story, they can be really great for creating a mood if I’m writing an action scene or a sad scene or a scary scene. That’s really funny because it’s well known among my friends that I like most of the same stuff as 13-year-old boys. I like space, adventures, robots, dinosaurs, and video games, so my own interests actually aren’t that far off from my audience. Can you blame me? Grown ups have mindsets full of jobs, bills, and achy bones. They’re boring!